Labelcall easly integrates with your shop, CRM or ERP system and provide all the necessary information on your mobile phone. 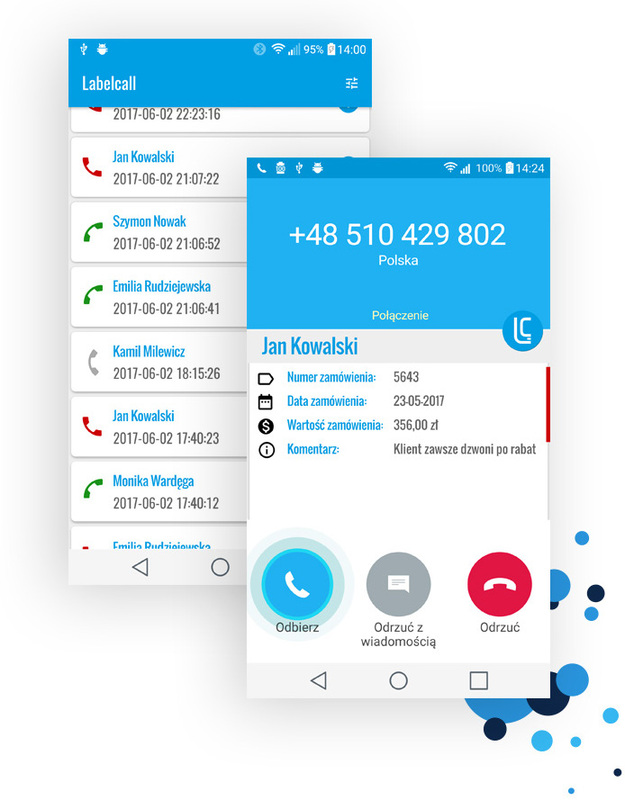 Within couple of minutes you can use all the features and surprise your customers with unique experience when they call you. Labelcall is available on the Shoper App-Store. Thanks to ready-made integration you need just a few clicks to connect all the Shoper data with Labelcall and your mobile phone. Try it now! Thanks to personalized contact you can build your brand and long-term relationships with clients. Creating unique customers’ journey is a crucial factor of improving your business. Thought leader grok minimum viable product engaging human-centered design agile user centered design agile responsive ideate ship it iterate. Want some more information about Labelcall and our services? Contact us immediately. Wyrażam zgodę na przetwarzanie moich danych osobowych przez LABELCALL sp. z o.o. - administratora danych osobowych - w celu obsługi zapytania. Podanie danych osobowych jest dobrowolne. Osobie, której dane dotyczą przysługuje prawo wglądu do danych osobowych oraz ich poprawiania. Copyright 2017 by Labelcall Sp. z o.o. All rights reserved.